Ardent Atletico Madrid devotees who waged their entire piggy bank on their team, hoping they’d clinch even a gram of silverware this season might as well beat themselves to death. This season promises to be no different than any other of the difficult campaigns endured in recent memory. Even worse, it could prove to be a disaster if new boss Quique Flores cannot turn it around. 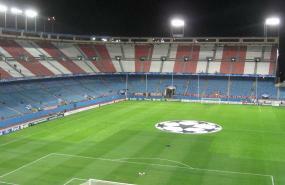 At the time of writing, Atletico sit 17th in La Liga, have had their Champions League hopes ended, and morale plunged further after the 3-2 derby defeat against sworn enemies Real Madrid, meaning that the Mattress Makers are witnessing their worst start to a season since being promoted back to the top flight in 2002. What Atletico Madrid are going through is a crisis on the pitch and more specifically a crisis of their system. Of course, off the field incidents, including squabbles between directors, sporting directors and presidents doesn’t help, but there remains an abundance of quality for any coach to work with. On the pitch, a lack of communication is there for the opposition to dwell on, and this continues to be aggravated match after match, with further criticism after each lapse piling on yet more pressure. The capital club employ the traditional 4-4-2 formation, getting the most out of the presence of highly skilled wingers such as Maxi Rodriguez, Simao Sabrosa and Jose Antonio Reyes. This momentously aids their attacking build-up play, especially in the presence of vigilant and opportunity-taking forwards such as Sergio Aguero and last year’s Pichichi winner Diego Forlan. That’s great, but where does the problem lie? What is the motive behind their failure to record win after win? Looking closely, it becomes clear that Los Colchoneros are dying in the creative central sector. Their middle of the park duo consists of Paolo Assuncao and Raul Garcia, and while the former is a very-defensive minded player, Garcia has failed to reproduce his best ever since arriving from Osasuna in 2007, being particularly exposed in his duel with Lassana Diarra in the Madrid derby. Without their very own Xavi Hernandez or Cesc Fabregas, it is impossible for “Atleti” to play their football, leaving motion of play to be dictated by their opponents on any given night. One player who could be the missing link in Flores’ team is Jose Manuel Jurado. The Real Madrid canterano remains the team’s only pure attacking midfielder, and after a year well spent with Mallorca last term, he could be the general of Los Rojiblancos’ midfield. That does not automatically indicate that he is the right man to be thrown straight into the lions’ den though, as he still has much to learn. Another problem seems to be that of the defence. After Atletico Madrid recruited Real Betis legend Juanito over the summer following the Andalucians’ relegation to the Segunda Division, it was expected that the back-four would gain experience from such a veteran defender. Yet it has been a mixed season for the backline, with noticeable inconsistency playing its part in the team’s drop towards the danger zone. Only Tomas Ujfalusi seems to be enjoying a steady season so far, constantly shifting between centre-back and full-back whenever needed, while the decision to sell Dutchman John Heitinga to Everton in the summer looks a bad move. An added main protagonist in this play’s tragedy seems to be sacked coach Abel Resino. While the retired keeper managed to guide the team to fourth place last season, his disastrous start to this campaign meant that the clock was quickly ticking. Resino wasn’t doing himself any favours either by not answering his phone as his career was going down the drain, should club director Jesus Garcia Pitarch be believed. As a result, Resino was ousted, and the board quickly turned to former Valencia coach Quique Sanchez Flores, even though rumour has it that the likes of Michael Laudrup and Luciano Spalletti were the first-choice names. Yet, improvements quickly appeared under Flores: 1996’s double winners led the return Champions League game against Chelsea, and might well have claimed the spoils had it not been for two flashes of brilliance from Didier Drogba. Furthermore, Sergio Aguero’s introduction against Real Madrid sparked life into what was seemingly a lifeless and spineless corpse, despite the Galacticos eventually winning 3-2. A 2-1 defeat to Deportivo La Coruna was no disgrace with the way the Galicians have been playing this season, and a 4-0 home win over Espanyol was a sign that perhaps Quique Flores is heading in the right direction. Even though Flores’ career as Atletico’s coach started sourly (with a 1-0 defeat to Athletic Bilbao), the positives taken from the games against Chelsea, Real Madrid and Espanyol are evidence that there is life still left in Atletico, and this life greatly depends on a certain Kun Aguero. Flores has already admitted that seeing Aguero on the training pitch he soon realised he had a very special talent on his hands. On the score-sheet twice against Barcelona’s city rivals, Diego Maradona’s son-in-law is quickly turning into he on whom much rests and has the potential to go all the way and eclipse Fernando Torres in Los Colchoneros hearts. That is, if he is not sold in January. All is not lost for Madrid’s middle-class team. Quique Flores has the ability to turn things around for Atletico, as he did for a good while at Valencia. Bringing the former Benfica boss in at the Vicente Calderon seems like a good step in the right direction and his tough training methods and no-nonsense approach is already rubbing off. – Can Zlatan Ibrahimovic Finally Silence his Critics?